One of the most vexing yet ubiquitous part of our digital existence is email. It seems everything we do generates an email — from resetting a password, confirming a purchase, or social media activity. No wonder we use words like “overload,” “avalanche,” “tyranny,” and “out of control” when describing our digital inboxes. White collar workers are said to spend as much as 6.3 hours a day reading, writing and responding to email. While some are predicting that email as we know it is will be obsolete by 2020, and that kids under 25 seldom use it, it is still with us. Until it is supplanted by a better form of electronic communication, the best we can do is learn how to cope with what we have. 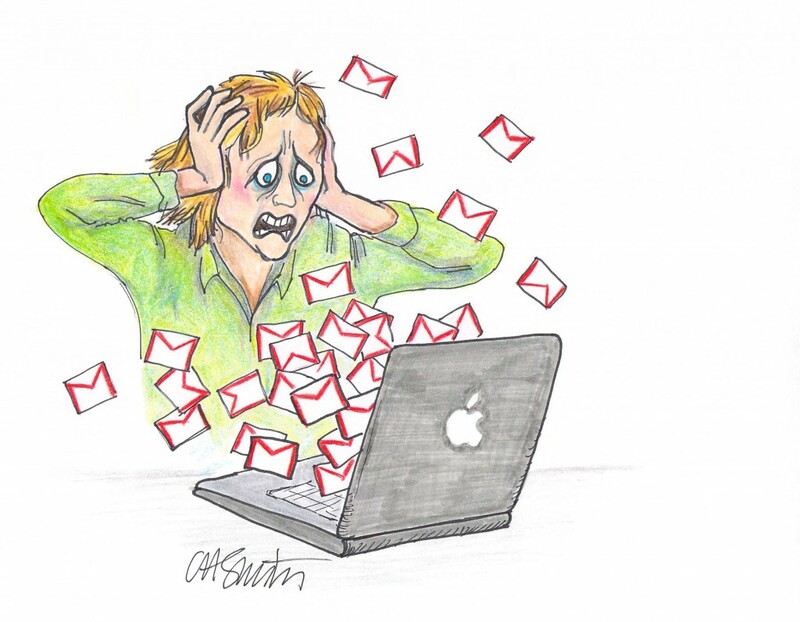 Getting a handle on email requires resolve and new habits. It is a lifestyle solution with no silver bullet. What you need are parameters you can live with to best manage your email. Here are some general coping mechanisms. I will go into more detail on a few of these in later blogs. Don’t worry about the old emails littering your inbox. It’s more important to set new habits going forward. Once you’ve established a workflow, you can sort through the backlog when you have a free moment. The inbox is the inbox. All email you receive goes to the Inbox by default, but don’t let messages hang out there. Treat new messages as you would any incoming mail. To help process email, create folders to organize your messages. In Gmail, folders are called Labels. Apple Mail and Microsoft Outlook both have folder capabilities. I’ll talk more about folders in a subsequent blog. Rules in email allow you to direct incoming mail directly to a folder, bypassing the Inbox if you want. You can set up rules on a variety of criteria – subject, sender, recipient – and set specific actions for each. Most email programs allow you to flag or star messages to identify urgent items. You can color code flags to indicate the type of action. Use flags alone or in conjunction with your folders. All email software today have effective spam filters. In your Preferences or Settings, you can control the strength of your spam filter. You can even block specific email addresses. Remember to check your spam folder periodically. Sometimes an important email gets caught in the spam net. In general, turn off notifications on your computer and mobile device. A sound or a message popping up on your screen is a distraction. If you set aside time during the day to deal with email, you don’t need to be notified each time a message arrives. To get good emails, write good emails. Use a descriptive subject line, dispense with salutations and sign-offs, keep the message short – ideally no more than three or four lines – and use a signature block. This is the most important and the most difficult rule to follow. When you interrupt a task to read an email, you lose the time it takes to read and/or respond as well as the time it takes to re-orient to the task you interrupted. Try to schedule a specific block of time once or twice a day to deal with email. If it’s that important, you should be making a phone call. I’ve talked about creating folders and setting up rules in your email programs. In a later blog, I’ll go into some detail about creating and using folders, but I don’t have space here to describe everything your software can do. Experiment. Click on drop-down menus. Don’t forget that the internet is a vast repository of information! Google a question, like, “How do I set up folders in Outlook?” and you’ll find answers. Don’t forget to search YouTube as well. If you have a knowledgable friend, ask her.